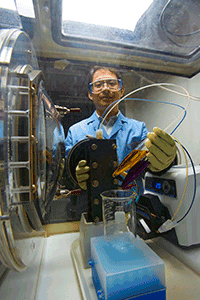 PNNL researchers are developing materials and batteries for stationary energy storage applications, as well battery testing. Sustainable energy, stationary energy storage will be vital to adding renewables, such as wind and solar, to the power grid, and perhaps even to make the smart grid a reality. Renewable energy sources have the potential to drastically reduce greenhouse gas emissions. But wind and solar are variable sources of energy that fluctuate depending on weather conditions. Because the power they produce is intermittent, it is difficult for utilities to predict when the power will be available and increases the complexity of operating an energy system that must constantly match supply and demand. Large-scale energy storage is key to integrating renewable resources like wind and solar into the power grid. Large-scale energy storage will allow us to use renewable energy when and where power is needed, taking full advantage of high penetrations of renewable energy sources. Similarly, advanced energy storage materials are needed to improve the performance and reduce the cost of deploying electric vehicles. Safe, high-capacity batteries that can be quickly and repeatedly charged and discharged are needed to allow widespread deployment of electric and hybrid vehicles. Taking current batteries to the next level requires revolutionary breakthroughs in materials science. At Pacific Northwest National Laboratory, scientists are conducting research in two key areas: analysis of the electric grid's ability to store renewable energy; and materials for batteries needed to store renewable energy and power electric and other fuel-efficient vehicles. Analyses of technological, economic, and regulatory issues related to the role of storage in the power system are needed to better understand performance requirements and price points necessary to integrate storage batteries into the electric grid in the most cost effective and efficient way. We have a team of materials scientists, chemists, system engineers, and electrical and chemical engineers assessing the technical obstacles and cost issues that stand in the way of broader market penetration of energy storage. One goal of this team is to define the needs and requirements of large-scale storage technologies as part of the grid and infrastructure planning process.